Canada-based ONE OCEAN EXPEDITIONS, represented by ACTIVE TRAVEL in Australia, has announced a significant coup for the forthcoming 2010 Antarctic season. 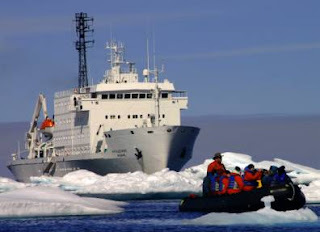 Commencing 16 January 2010, ONE OCEAN will operate the well-known Russian research vessel, Akademik Ioffe, formerly chartered by US-based Quark Expeditions. ONE OCEAN'S CEO and ex-Australian resident, Andrew Prossin, said " Akademik Ioffe has been sold in the Australian market for years. I worked with this vessel for many seasons and in my opinion she is the best-equipped Antarctic expedition vessel in the world. I am delighted to have secured her for the 2009/10 Antarctic season". The Akademik Ioffe was commissioned by the Soviets in 1989 and was originally designed as high-tech "spy ship". She was never really used for that purpose however her sophisticated ballast systems and ultra-quiet engines make her an ideal vessel for polar exploration. According to Prossin, she is "about as quiet and vibration free as they come". Andrew Prossin is a veteran of approx 150 voyages in Polar regions and is at the forefront of polar innovation. Some years ago he introduced sea-kayaking options to the Australian market and his 2010 programmes contain a number of creative options. First, he will reduce passenger numbers from 110 to 86, providing the highest staff/client ratio in the industry. Secondly, each voyage includes four 'Adventure Concierges', setting new standards for customer service. Their role is simply to engage with passengers at whatever level is required, to ensure they get the best from their Antarctic adventure. ONE OCEAN is also unique in the expedition cruise industry by offering a wide variety of options to clients every time they leave the ship. These include sea-kayaking, guided hikes, zodiac cruises, bird-watching programmes – with passengers able to choose their preferred activity each time they go ashore. And an overnight adventure camping option (normally over A$200) is free of charge including all necessary gear. By reducing passenger numbers from 110 to 86, there is considerable extra space on board. Each expedition will now include a massage therapist and a new onboard spa will provide a variety of relaxing and therapeutic services at an additional cost. The company has also developed an 'Active Cruising' programme, bringing fitness and adventure together into a unique package. An onboard personal trainer will offer a regular programme of fitness and training sessions so that participants are well prepared for daily activities – and for the delicious meals prepared by the Canadian chef! Five expeditions are offered next year, including three 10 night cruises to the Antarctic Peninsula, a 12 night expedition to the South Orkney Islands, Weddell Sea and Antarctic Peninsula and an 18 night trip to the Falkland Islands, South Georgia and the Antarctic Peninsula. For brochures and further information contact ACTIVE TRAVEL in Australia on 02-9264 1231 or visit www.activetravel.com.au.